A city is hit by an epidemic of "white blindness" that spares no one. Authorities confine the blind to an empty mental hospital, but there the criminal element holds everyone captive, stealing food rations and assaulting women. There is one eyewitness to this nightmare who guides her charges—among them a boy with no mother, a girl with dark glasses, a dog of tears—through the barren streets, and their procession becomes as uncanny as the surroundings are harrowing. As Blindness reclaims the age-old story of a plague, it evokes the vivid and trembling horrors of the twentieth century, leaving readers with a powerful vision of the human spirit that's bound both by weakness and exhilarating strength. 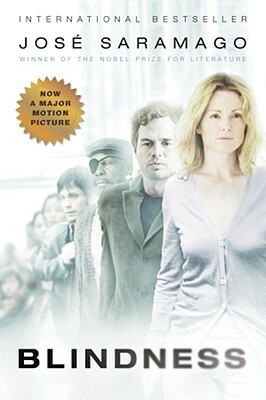 What is Saramago”s purpose in presenting the doctor”s wife as the only person not afflicted by the white blindness? In what ways, and in what stages, does she grow in terms of both political and moral authority? What roles does she assume? How may we explain, in particular, her assumption of responsibility as guide and protector? Why does she experience a feeling of intense, unbearable loneliness at just that moment when the others begin to regain their sight? What is the purpose of Saramago's use of proverbs, folk sayings, and cliches throughout the novel? How does the characters” new reality affect their former habits of expression and create new habits of expression? What are the implications of the narrator”s later comment that “if sayings are to retain any meaning and to continue to be used they have to adapt to the times”? As the white blindness spreads, the Minister of Health decides on the necessity of quarantine “both from the point of view of the merely sanitary aspects of the case and from that of the social implications and their political consequences.” What “social implications” and “political consequences” do you think the minister has in mind? What social and political consequences does the quarantine itself have? Waking to her second day in the mental hospital, the doctor's wife thinks, “what fragile walls we'd make” against our enemies. What “fragile walls” are erected, demolished, or made useless by the blindness? What fragile walls in your life and community would be threatened by a catastrophe similar to the white blindness? “The whole world is right here,” the doctor's wife says to her husband on the morning of their fourth day in the hospital. In what ways does the mental hospital contain “the whole world”? To what extent may we read Blindness as a commentary on the excesses and horrors of the world of the twentieth century? What meanings can we attribute to the white blindness? To what extent does it represent ignorance, political ineptitude, the absence of personal and social morality, and the failure of imagination? What other meanings can you suggest? How does the “harsh, cruel, implacable kingdom of the blind” differ, if at all, from our everyday world? Why does Saramago provide no names for his characters and their city and country? What are the effects of this namelessness? In what ways do the central characters” experiences lead them to a new kind of interdependence and, at the same time, a new awareness of the human potential for selfishness and cruelty? How do both contribute to the emergence or reemergence of tenderness and love? What pattern emerges in respect to the breakdown of order and of the various systems that we all take for granted -civic, social, political, and so on? How do individuals, identifiable groups, and institutions of authority contribute to that breakdown? How does the structure of society itself alter to fit a world in which virtually everyone is blind? How do the women in the novel differ from the men in their attitude toward the blindness and the resulting conditions of life? What moral, emotional, psychological, and imaginative capacities do the women possess that the men lack? Variants of the phrase “when the beast dies, the poison dies with it” recur in the novel. And we are told that “the mind suffers delusions when it succumbs to the monsters it has itself created.” What beasts and monsters, actual and delusional, are the subjects of this novel? In response to the newly interned old man”s report on conditions outside the hospital, the doctor comments, “Perhaps only in a world of the blind will things be what they truly are. . . . People, too, no one will be there to see them.” In what ways might this be true, and to what degree? At the very end of the novel, the doctor tells his wife: “I don”t think we did go blind, I think we are blind, Blind but seeing, Blind people who can see, but do not see.” What does he mean? How is this judgment related to the first blind man”s report to the doctor that his going blind was “More like a light going on”? How does the novel illustrate the doctor's wife's observation that “what is right and what is wrong are simply different ways of understanding our relationships with others”? One reviewer has noted that Blindness conveys “the disturbing notion… that full humanity is achieved only through suffering.” Do you agree or disagree with this statement, in respect to both Saramago”s novel and actual life? Which characters achieve a fuller humanity because of their suffering?